Mr. Nathaniel McAllister, Sr. 71, of Wilson, NC, passed away on October 24, 2018 at Wilson Rehabilitation and Nursing Center.in Wilson, NC. The funeral service is scheduled for Saturday, October 27, 2018 at 2:00 pm at Stevens Funeral Home, 1820 Martin Luther King, Jr. Parkway, Wilson, NC. Apostle Mary Mahone will deliver the eulogy. Burial will follow in Hamilton Burial Garden, Lane Street, Ext., Wilson, NC. A public visitation will be held on Friday, October 26, 2018 from 3:00 pm until 7:00 pm at Stevens Funeral Home, 1820 Martin Luther King, Jr. Parkway, Wilson, NC. 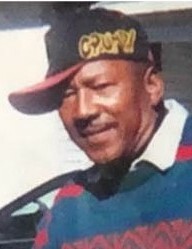 Mr. McAllister was preceded in death by his son, Chadwick McAllister; his parents, Eugene McAllister and Etta Bullock McAllister; one sister, Shirley McAllister and one brother, George McAllister. He leaves cherished memories to: his wife, Cathy L. Phelps McAllister of Wilson, NC; one son, Nathaniel McAllister, Jr. of Greensboro, NC; four daughters, Malicia McAllister of Knightdale, NC, Angel McAllister Santiago (Silverio) of Rocky Mount, NC, Davonnya Phelps and Lavonnya Harris both of Wilson, NC, seven grandchildren; seven great grandchildren; five sisters, Esther Simms and Margaret Jackson both of Wilson, NC, Irene Holden of Raleigh, NC, Eyvonne Mason of Virginia and Annie D. Cameron of Long Island, NY; three brothers, Eugene McAllister, Jr. of Newark, NJ, Bobby Willingham and Alfred McAllister both of Wilson, NC; five sisters-in-law, Joan Handy (Roy) of Eden, NC, Dorothy Ward of Manassas, VA, Wanda Farmer (Roger) and doris McAllister both of Wilson, NC and Judy Phelps of Highpoint, NC; one brother-in-law, Kenneth Phelps (Belinda) of Highpoint, NC; a host of nieces, nephews, cousins, other relatives and friends. The family will receive friends at the home, 5015 White Oak Loop, Wilson, NC where they will assemble on Saturday at 1:00 pm in preparation for the funeral procession. Condolences may be posted to www.stevensfamilyfuneralhomne.com or faxed to 252-991-5849. "Committed to Serve, Committed to to Care"